TR: Different way to get my point across. JM: There seems to be no real process that I can put my finger on. The closest I can figure is that I am a hopeless romantic and when I start writing it just seems to flow out of my mind, to my hand, to paper. When I was younger I was constantly writing love poems to the girls. Unfortunately, I never made copies of them. However, I did have a lot of girlfriends. TR: I take things out of my life that have a deep impact. JM: Let’s see, I’m 56 now. Not counting the time that my hand was idle, I’d have to say 43 years. Even though I had quiet time, the romantic has always been in there. Even the poem I wrote for the book is not directed to the ladies I feel it does have the romantic warrior feel to it. JM: Ever since I heard the Beatles, the Monkeys and the Doors, the list of musicians could go on and on, but I’ll leave it with that. I’m a dyed in the wool Hippie and “make love not war” is hard pressed in my soul. BCP: Your poetry is raw, honest, and stimulating. What do you try to convey to your readers? JM: For my poem, I was merely pointing out the futility that we face when facing off with the government and that in the end what the government has is being eroded with time. TR: Life looks good at times but you can turn it around and make it a good experince. JM: For the most part the book has has been worked on for about a year by the various people that have gone though the program at Sagatay. For me, my involvement has been about 3 months. My poem, about 4 minutes, the rest of my time was in layout and art. TR: 45 minutes to live it and an hour to write it. JM: Absolutely! While I was working with the group, I found that the talking had opened up the tap that had been closed for a long time. I seen things in different ways. And I felt some of the feelings that the other guys had expressed. The sharing of ideas opened the flood gates. TR: Yes, I got helpful tips on how to write and what to write. 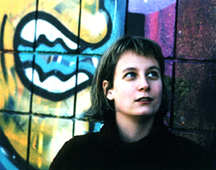 BCP: How was it working with Emily Pohl-Weary who is a young writer making a name for herself in Canada? JM: Amazing! Her energy is way up there. The way she asks questions to get us thinking was a definite eye opener. She got us all working together as a team. We all looked forward to the end result. And now that we have had the book printed she still exudes that energy. TR: She was very helpful on helping what to write and how to write it. BCP: Broken Arrow is comprised of writing by Aboriginal men trying to get back on the Red Road. The writing is heart-wrenching, challenging, and keeps the reader flipping pages. Do you think more publications like Broken Arrow need to be published? Is there a Broken Arrow # 2 in the making? JM: After consulting with Kerry Lambie the Training Co-ordinator, I have discovered that because of the success of the first edition, a second is definitely on par for the course. By success, I mean the way it has brought people together to share and create something meaningful and worthy of being proud of. TR: If the same care and thought goes into it, it will keep going on. BCP: What do you want the Aboriginal and non-Aboriginal communities to get from reading Broken Arrow? JM: Me personally, I would like for people to see that Indians are people too. We have all the same ups and downs in life, plus some. The only difference is that we are red. BCP: What advice do you have for other Native writers out there who are having difficulties with their writing, or who have yet to see their work in print? JM: Simply put, find Emily!!!! And, if need be, find and use the great opportunities offered by Sagatay’s Apaenmowineen. TR: To be honest with yourself and to have patience in what you’re writing, as well using your own expierences in life. BCP: Why the zine and the writing group? How did it all come together? EPW: It’s a bit of a long story. Three years ago, a young family friend was shot to death a few blocks from the home where we grew up. I couldn’t make sense of all the violence going on in the neighbourhood, so I decided to start a writing group called Parkdale Street Writers for local youth (16-25 years). Writing is one of the things that’s really helped me throughout my life. Meeting other people with similar creative interests, and getting the opportunity to tell stories without shame in a safe space can help people deal with a range of painful and beautiful experiences. It also helps ease the sense that no one cares some adolescents are literally coming of age in war zones. One of the staff at Sagatay (Kerry Lambie) heard what I was doing in Parkdale and asked me to come in and run a series of four workshops for the guys in their Apaenmowinneen (new beginning) program. Those initial workshops went well, so they invited me back for four more, and then extended my writing group indefinitely. I’m constantly on the look-out for new work by Aboriginal and non-Aboriginal writers that will speak to the men’s lives and experiences. I bring in guest writers to work directly with the group – so far we’ve had visits from Marie Gaudet, Robert Priest, Lee Maracle, Tamara Berger, Dale Gilbert Jarvis, Ziadh Rabbani, Susan Musgrave and Willow Dawson. Although I’ve had five books published, my first “publications” were my own zines, which had titles like “We Have Lives” and “They’re Just Words.” That’s how I learned to let go of my writing and get feedback from strangers. I kind of used those zines as business cards for many years. Because of this, I keep my workshops focused on a tangible end result as we go along – a unique publication developed entirely by the participants. BCP: Was it your first time working with Aboriginal people and writers? EPW: Kind of, yes. There was and continues to be a steep learning curve for me. I did have a little experience through Parkdale Street Writers (a couple of the regular participants are Native) and because I was a visiting author at the Labrador Creative Arts Festival, which brought me to remote Innu and Inuit communities in northern Labrador and around Happy Valley-Goose Bay to run writing workshops. BCP: What was the process and structure of the writing group? EPW: We meet once a week for a morning, talk and joke and argue a lot, read inspiring stories or poems or movie scripts (whatever the subject is that week), and do a couple of writing exercises. The process of deciding what to write is largely inspired by the participants and what they show an interest in doing. Sometimes people get so inspired by what we start that they continue to work on larger pieces throughout the week. I love that. BCP: The poetry in Broken Arrow is raw, honest, and stimulating. How was it working with a group who explored such important and sensitive subjects? EPW: Very inspiring. At times it was also heart-breaking. BCP: How long were you working on putting together Broken Arrow? BCP: What did you learn from this experience? EPW: So much. I learn every single day from the guys at Sagatay about honesty and bravery, respecting and caring for Mother Earth, and how everything and everyone is connected. I also learn how to reach out for support, about picking myself up when I fall, the power of humour and great storytelling… I could go on and on here! EPW: Many, many publications like Broken Arrow need to be published. I feel very strongly about this. But they have to be shaped by the writers themselves and develop organically. I have so much respect for the men in this publication and the path they are each on. Success, in my opinion, is not about attaining specific goals, it’s about how we hold ourselves as people, the choices we make, and the interactions we have with others. Honestly, the important thing about this writing group is not the publication itself, but the process. I hope that Sagatay remains a safe space for men to accept help and open up to positive change, little by little. Writing is just a part of that. BCP: Will the writing group at Sagatay continue for another cycle? EPW: Yes, I certainly hope so. I look forward to each and every week. That said, I only want to be there as long as the guys themselves feel like my workshops are a valuable part of their experience. I never want to feel like I’m forcing my ideas or workshops on anyone. EPW: That we can rewrite the so-called official history, one story or poem at a time. The generational effects of colonization, residential school syndrome, homelessness, mental health and addiction issues have had devastating effects on Aboriginal communities. This has to change, and it has to change immediately, one mind at a time. Each of us has the power to shape the future, though it may sometimes feel painful and slow and frustrating. By speaking our truths and demanding rights and respect, we can change the world and the paths of our own lives. All we really have as individuals are our stories and no one else can, or should, tell them for us. EPW: My advice is to keep writing and reading and thinking about how other people you admire tell stories. If you can’t seem to break into the publishing world, create your own forum: something like Broken Arrow or BlackCoffeePoet.com or Kiss Machine (the little magazine I published for eight years). Honestly, just don’t give up! Keep struggling and perfecting your craft and eventually you will get opportunities. 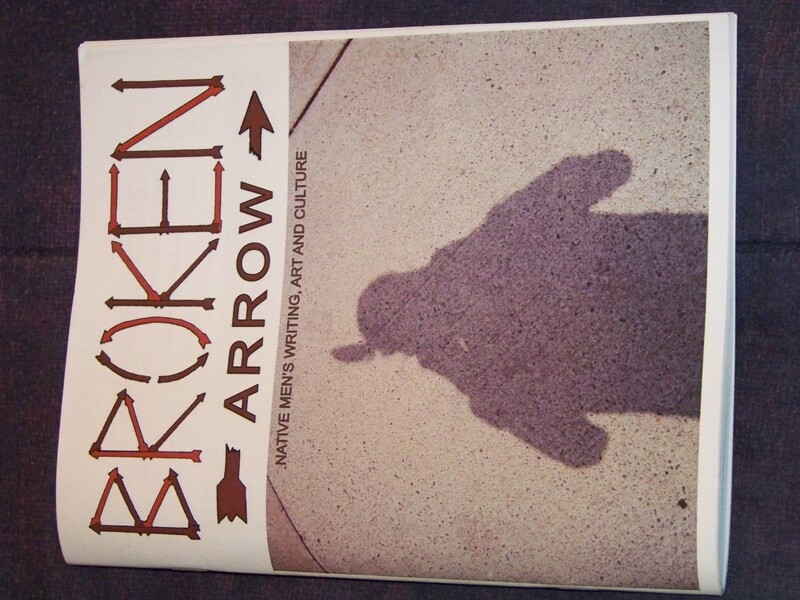 Come to the launch of Broken Arrow, a collection of writing by the Sagatay men’s writing group. Enjoy readings, music and art by the contributors! There will snacks and friendly faces. Hope to see you there. Tune in to Black Coffee Poet Friday October 15, 2010 for video of Broken Arrow contributors reading their poetry. This entry was posted in Poetry and tagged and Culture, Art, Black Coffee Poet, Broken Arrow, Broken Arrow: Native Men's Writing, Emily Pohl-Weary, https://blackcoffeepoet.com/, Interview with James C. Miles and Tim Renollet and Emily Pohl-Weary, Jorge Antonio Vallejos, Native Men's Residence, Sagatay, Sagatay Apaenmowineen program, Writing Group. Bookmark the permalink.